As the movie would become a major box office smash, The King kept his audience wanting more as the LP would go on to become one of the biggest soundtracks album of his career and one of the biggest soundtracks of the sixties. 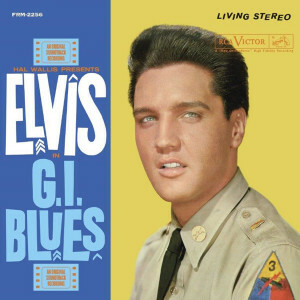 Even more hits abound with the sensational classic title track "G.I. Blues" , the blues rocker revisit of Carl Perkins' "Blue Suede Shoes" , and the powerful rockers"Shoppin' Around" and "Frankfort Special." As we further continue our exciting Elvis Presley 180 Gram Audiophile Vinyl Series, we are pleased to present this masterwork now mastered impeccably by Joe Reagoso at Friday Music Studios & Capitol Mastering and pressed at R.T.I. for a super limited time on stunning Clear, Blue and Gold Swirl Vinyl. "G.I. Blues" will be a much anticipated audiophile dream release for Elvis fans everywhere! For this exclusive release, we are also including a first time limited edition gate fold album artwork presentation, and a striking 24" x 24" full color poster.